Get A Classic Look That Can Withstand Your Lifestyle. Want a hardwood floor but are worried that your active kids (and all their friends, toys, roller skates, hockey sticks and other assorted gear) will wreck your investment? Or what about that lovable but wild dog of yours? Worried that he’ll tear up the finish? Or maybe you’d love the look of stone, but hate how hard and cold it can be on your feet. Laminates may be the answer for your active home. Easy to install for the motivated do-it-yourselfer and easy to maintain for the I-don’t-have-time-to-mop-every-dayer, laminates are very popular for families and people who love pets. With hundreds of styles and colors to choose from, laminates have realistic looks that will surely fit your style and budget. New laminate products include strip wood looks with real beveled edges and realistic textures making them even more authentic looking than ever before. Likewise, the ceramic looks feature a low-gloss grout line designed to exactly mimic the look of real ceramic. On top of the improved looks, laminates carry warranties that guarantee the product will never wear out, fade or stain, so you have the assurance that your family won’t destroy your new floor. Laminate gives you the best of both worlds: a floor that looks like real wood or ceramic and the peace of mind knowing that it’ll stand up to an active home life. Are you looking for more information on laminates? 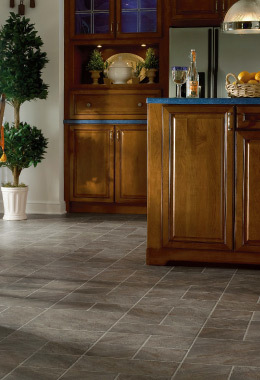 Our “Laminates 101” will give you everything you need to make an informed decision.